The need for portrait-oriented vertical displays grew out of Apple’s popularity with creatives. Macs generally took a backseat to IBM PCs running Windows. However, they became ubiquitous in the publishing industry within a few years of coming on the market. Macs proved especially good for magazine layouts due to the WYSIWYG (“What You See Is What You Get”) interface, which let users see the end result of a document or layout before printing it. This stood in stark contrast to many PC programs at the time. 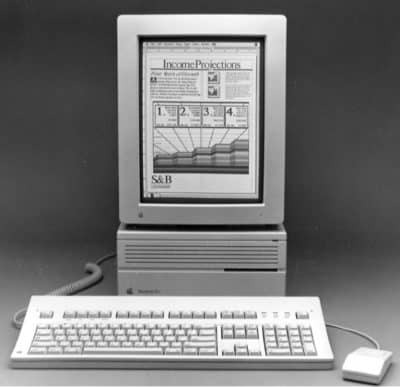 Apple also benefited from programs like early desktop publishing software Aldus PageMaker. Radius set the precedent with its vertical monitor. 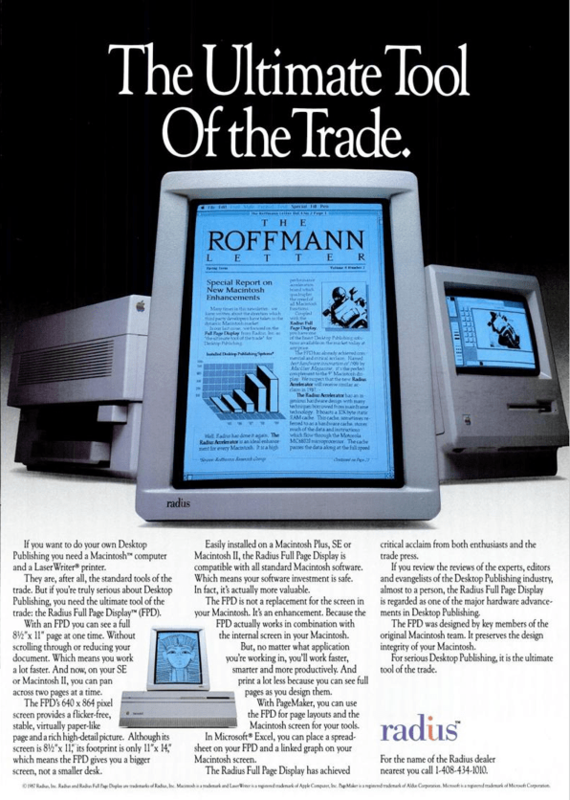 The Radius Full Page Display shipped in 1988, a year before the Macintosh Portrait Display. Radius dropped the price of its monitor to $895 when Apple’s alternative arrived the next year. 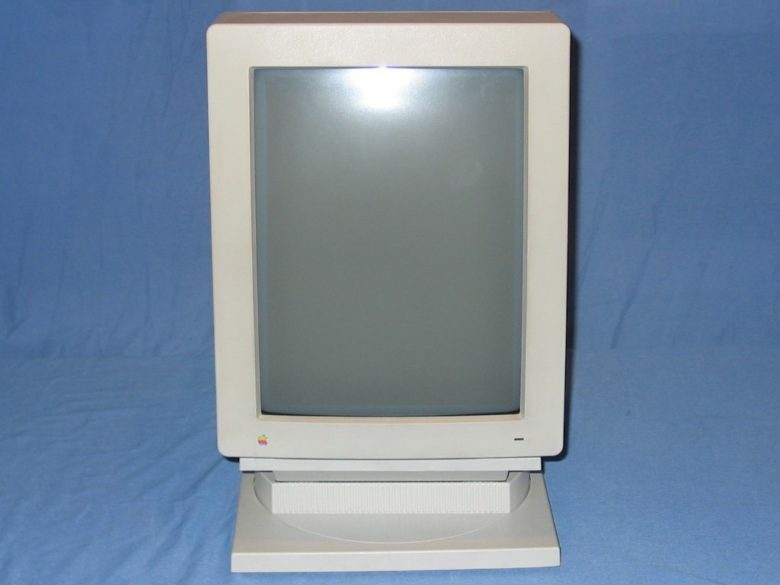 The Macintosh Portrait Display was one of the best Apple displays of its time. The Macintosh Portrait Display offered a resolution of 640 by 870 pixels at a pixel density of 80 dots per inch. It boasted antiglare technology and an impressively crisp flatscreen form factor. It wasn’t perfect, though. The Macintosh Portrait Display could prove temperamental. In fact, Apple’s troubleshooting manual noted that “environmental influences” could cause the monitor to glitch. What kind of environmental influences? Try close proximity to metal desks, file cabinets or bookshelves. Or being situated near fluorescent lights, other monitors or electronic appliances such as coffee makers or copy machines. “These objects cause dynamic raster distortion — that is, movement or jitter of the image,” Apple noted. The Macintosh Portrait Display lasted until December 1992. At the time, people viewed it as a quirky experiment from Apple with only limited applications. Today, it appears very clear that an elongated display was an innovation very much worth pursuing — seen most notably through the way we vertically view web pages on our iPhones. Do you remember the Macintosh Portrait Display? Leave your comments below.